Tap New Work Order on the menu screen. 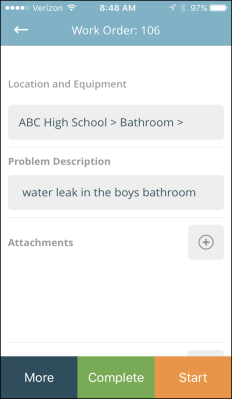 Tap the plus sign icons ( ) to select the Location, Bldg./Unit, Area, Area Number, and Equipment if needed. Enter the Problem Description. You can use voice-to-text to enter this information as well. To add an Attachment, tap the plus sign icon ( ). Tap the camera icon ( ) to take a new photo, tap the pen icon ( ) to add a signature, or choose to add a photo from the list. 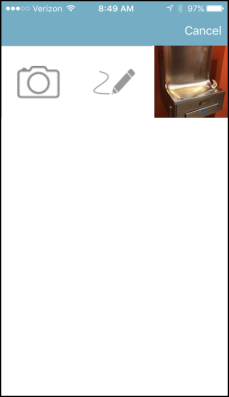 You can remove the attachment by tapping the trash can icon ( ) or add another attachment by tapping the plus sign icon ( ). 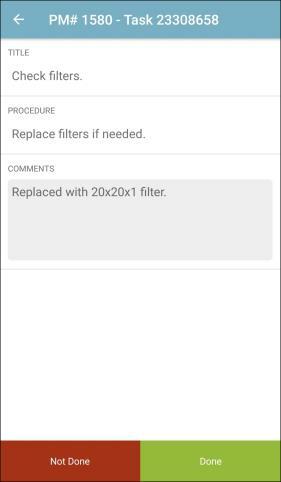 Your information will appear as the Requester info, but you can tap your name to change the requester to an existing user in the list. Select an Assigned To (available only to Administrators and Supervisors), Craft, and Purpose for this work request. Click Create to submit the work order. Click Create & Complete to enter an Action Taken, adjust the timer, and mark the work order complete. Tap Unassigned Work Orders on the menu screen. Swipe the work order you want to assign to the right . You can also reassign a work order to different user if needed. 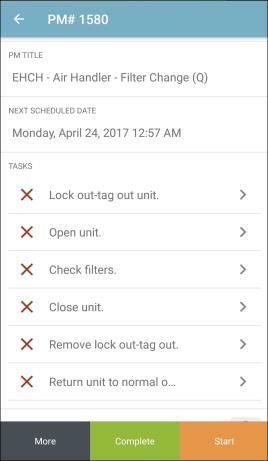 Tap to open the work order and scroll down to the Assigned To field. Tap the assigned user's name and select a new user from the list. Work Center gives you the ability to add attachments to a work order such as a photo or a signature indicating that the work order has been complete. 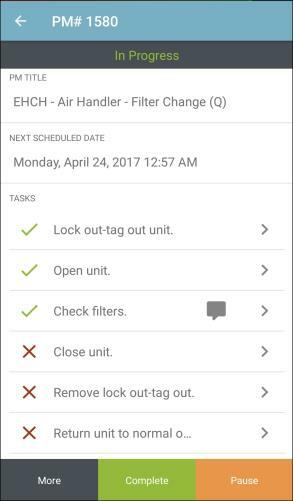 Search for and tap on the work order you would like to add the attachment or signature to. Tap the plus sign icon ( ) next to Attachments. When handling a PM work order in Work Center you will see the PM work order's tasks and procedures listed in the work order details. Tap on an individual task to view more details. If applicable, you can see additional details on the task in the Procedures section. Tap the Comments section to enter any notes necessary. *Note: You can use voice to text to enter information in this field. Tap the Done button to mark the task as complete. As you complete tasks on the PM work order, you will notice that completed tasks will change from a red x to a green check to indicate completion. Any tasks where comments were made will show a comments icon next to the task. From your My Open Work list, swipe to the right on the In Progress work order you would like to complete. Or tap on the work order from the list and tap Complete. Enter an Action Taken description. *Note: You can use voice-to-text to enter information in the Action Taken field. 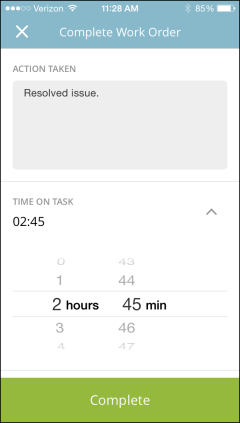 Adjust the Time on Task timer if necessary. Tap Complete at the bottom of this screen to record the labor hours from the timer and mark the work order Complete. 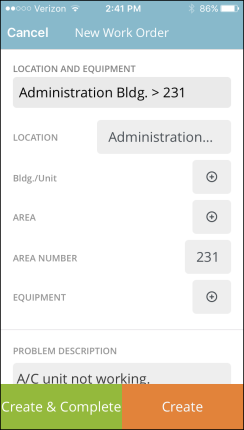 Once you mark a work order complete, it will move from the My Open Work Orders screen to the My Finished Work Orders screen.